Tokyo, Japan, April 10, 2018 – Universal Music Japan recording artist MIYAVI will perform a series of upcoming U.S. live concerts. 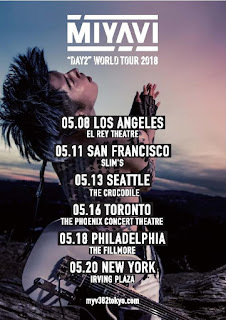 Through his management company, J-GLAM, MIYAVI has announced the North American dates as part of his current “Day 2 World Tour 2018”. The guitarist will be backed up on tour by longtime drummer Bobo as well as new bandmates DJ Jonny and 2 Chorus. MIYAVI will draw from material across his entire discography and is also set to perform his latest song, “Long Nights,” an intensely powerful track powerfully driven by pulsating guitars and punctuated with stark lyrics from Afghan phenom rapper, Sonita, who was herself the subject of an acclaimed eponymous documentary that took the World Documentary Grand Jury Prize and Audience Award at the 2016 Sundance Film Festival. Catch the music video for “Long Nights” HERE; the track is available now from iTunes and Spotify.